Delhi, Capital of India is where many tourists to India start. It is from Delhi that our tourist to India expeditions start. Delhi is India’s third largest city with a population of some 16 million people. Its importance was derived from its location on the main north-south and east-west route. Many different empires have had Delhi as its head quarters, today is no different with India’s parliament and beauracratic centre located in New Delhi. 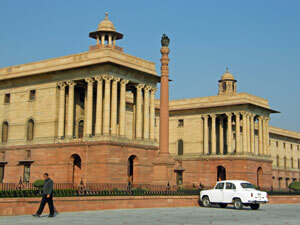 New Delhi was built by the British between 1911 and 1931 to be the show case of the British Empire. It certainly contains some really impressive buildings and is well worth a visit. Old Delhi has a number of 16th and 17th century Mughal monuments. The Red Fort was built in 1638 to 1648 when Shah Jahan moved the Mughal Capital from Agra to Delhi. Old Delhi supports a vibrant lifestyle with traditional traders who still live and operate from here. 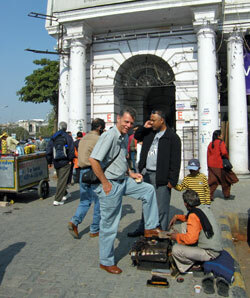 Old Delhi has much to offer the tourist to India. Delhi is also an important tourist centre with its International airport which is served well by flights from all over the world and flights within India. Delhi has a wealth of attractions that are worth visiting in their own right, as well as being a central point at which to set out to discovered other parts of India. You can hire vehicles, go by train, hire guides, go on tours, see cultural performances, you name it you are almost certainly able to do it from or in Delhi. Any tourist trip to India must allow a couple of days to explore Delhi.